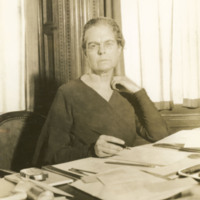 Later portrait of Marion Edwards Park at her desk. 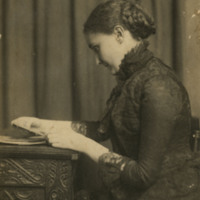 Portrait of Mamie Gwinn sitting at a desk as she appears to be reading a book. 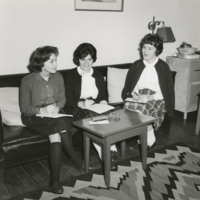 Photograph of an unidentified student from Denbigh dorm room. 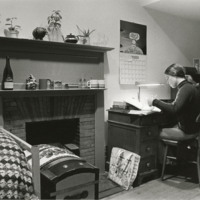 She is writing on a desk and a lamp light is on the desk as well. There is a calendar on the wall and the bed, fireplace mantle, canvas bag and what appears to be a dresser are pictured as well. 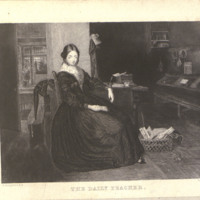 Mid 19th century Victorian print of a woman sitting in a chair, a basket full of books on the floor. 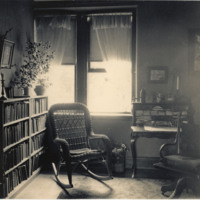 Her elbow rests against the desk, on which there are more books.